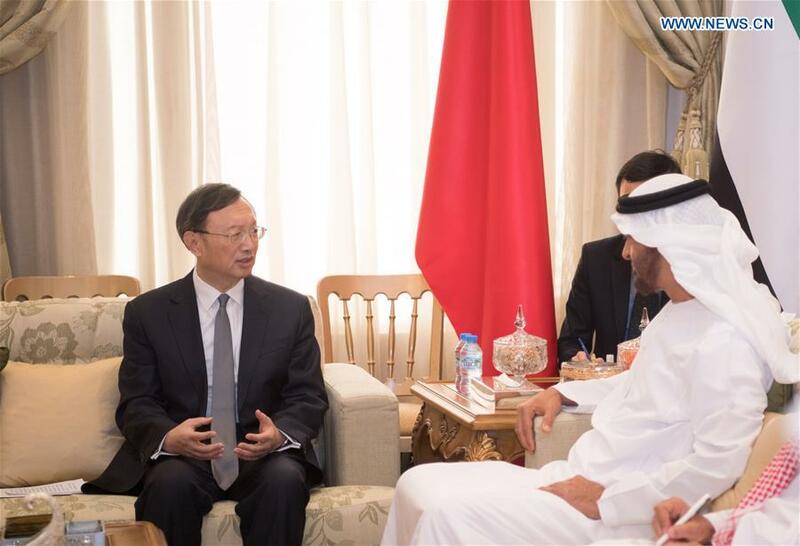 The Crown Prince of Abu Dhabi, Sheikh Mohamed bin Zayed Al Nahyan, on Monday met with Chinese President Xi Jinping's special representative Yang Jiechi here, and discussed means to further bilateral cooperation and the Belt and Road Initiative. The crown prince said that Xi's visit to the United Arab Emirates (UAE) last year has upgraded the bilateral cooperation to a higher level. He stressed that under the Belt and Road Initiative, the UAE is willing to implement, together with China, all the consensus between the leaderships of the two countries, enhance cooperation and coordination in international affairs, and boost the comprehensive strategic partnership. Xi paid a visit to the UAE in July 2018, the first by a Chinese head of state in 29 years to the Arab state. The two sides agreed that both countries will strengthen their in-depth cooperation in various fields, and promote continuous development of bilateral ties. Yang, also a member of the Political Bureau of the Communist Party of China (CPC) Central Committee and director of the Office of the Foreign Affairs Commission of the CPC Central Committee, said his visit is to help implement the consensus reached during Xi's historic visit. "China will join hands with the UAE to maintain the momentum of frequent high-level visits and make China-UAE ties closer," he said. Yang highlighted that bilateral cooperation, especially under the Belt and Road Initiative, has been proceeding smoothly, and both sides will guarantee all the related coordination to realize more practical fruits and benefit the two countries' people. Meanwhile, the two sides also agreed on more work on anti-terrorism for mutual interests and regional stability. Yang is now on his official visits to the UAE, Egypt, Equatorial Guinea and Cameroon scheduled from Jan. 13 to 19.